Transform your home into a cinema with a projector screen. A projector screen allows you to watch films, shows, sporting events, or presentations in big-screen format. 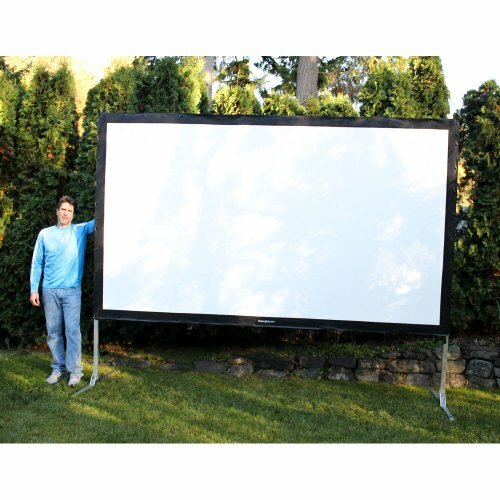 While many people associate projector screens with indoor viewings, many screens work equally well in outdoor settings. Whether you are planning a memorable date night or need the best way to watch the biggest football game of the year, the best projector screen can improve your spectator experience. An excellent projector screen is a great way to bring a box-office experience to your home or social event. However, shopping for projector screens can quickly feel overwhelming and technical. Before long, you may hear terms such as “pvc vs. polyester,” “image ratio,” “gain,” and “rear projection.” It is easy to feel discouraged while trying to pick the best projector screen that matches your setup and goals. 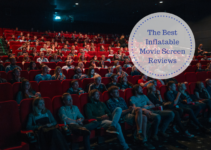 However, the following guide is here to simplify the process and help you make the best decision for your indoor or outdoor viewing experience. When choosing a projector screen, it is important to consider the type of material, ease of mounting, projection, and image specifications. The projector screen material affects the picture quality of your video by altering how much light it absorbs or reflects during a video screening. In addition, the material determines suitability for indoor and outdoor use, durability of the screen over time, and how easily (and how often) you can clean the screen. Some of the most common projector screen materials are polyvinyl chloride (PVC) polymer (a thick, anti-wrinkle material that deflects light), nylon (a thick, indoor cloth similar to material used in top movie theaters), and polyester (a weatherproof material great for outdoors but can also wrinkle easily). Some indoor projector screens even use fiberglass for its versatility and picture quality. Deciding how and where you will use the projector is paramount for determining which screen material works best for your event. Ease of mounting is another important factor for choosing a projector screen. If you use a screen primarily for travel and presentations, you may wish to consider a projector screen that comes with a tripod or carrying case. For home theaters and displays, you may prefer a wall-mounted screen. 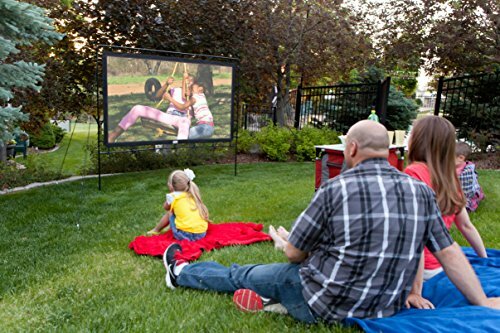 Outdoor events may require projector screens with sturdy frames or even ropes for mounting the screen between trees or from other convenient points. You should also note whether some brands require nails, tape, or other installation hardware. When a projector screen has both front and rear projection, viewers can sit on either side of the screen and enjoy the show. Projector screens used in classrooms, offices, and even home media rooms may not require rear projection since these projectors remain the front of the room. Wall-mounted projectors also have little need for rear projection. However, if you intend to use a projector for a large group or outdoor event (such as a concert or sporting event), you may wish to get a rear projecting option to ensure that everyone has equal exposure to the screen. A final factor you need to consider when purchasing a projector screen are the technical specifications. Some of the most important specs are image ratio, dimensions and viewing angle, gain. Image ratio or aspect ratio is an image format that determines quality of resolution. The most standardized image ratio is 16:9 because it allows you to view high definition, digital, and analog video. Dimension refers to the size of the screen (usually measured in diameter) as well as the viewing angle. While the size of your screen depends upon your audience, most outdoor screens start at 100-inches. Angle is important because a curved angle (usually ranging from 120 to 180 degrees may help you view high-definition or three-dimensional images better. Finally, gain is a ratio measurement of the reflection of light off of a screen surface. For example, a classroom white board has a gain ratio of 1.0. Typically, good projector screens do not exceed a gain ratio of 1.3 to avoid light reflectivity and flicker. A projector screen is the perfect solution for your audience to view video when a television is too small or insufficient. Screens can give you a cinema experience without the time and money it takes to visit theaters, and they command attention in business and classroom settings. Using a projector screen is also one of the best ways to stream video in large outdoor or social gatherings. 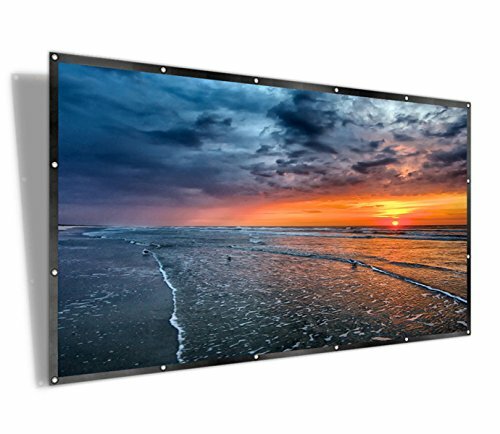 The best projector screens notate size, ease of mounting and assembly, portability, and viewing quality. For example, compact projector screens start around 80 inches in diameter size, while standard screens range 100 to 120 inches in diameter. Ease of mounting refers to provisions like included hardware, tripod, eyelets, or even ropes and frames. If you have a room devoted to home theater, for example, you may want a large wall-mounted projector screen. But if you need to move your screen often, you probably need a folding screen with a tripod stand. Those interested in saving space should consider roll-up screens that store away when note in use. Other notations to expect are good viewing angles (up to 180 degrees) and standard image ratios (usually 16:9 or 4:3). Finally, the best projector screens typically do not exceed a gain ratio of 1.3 to ensure high picture quality. Benefits: The TaoTronics screen features its own matching viewing stand and a wide 160-degree viewing angle. 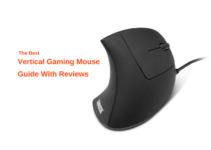 This curvature enables you to view features in higher quality than using a flat surface alone. Made of polyvinyl chloride (PVC) polymer, the screen itself is wrinkle-free and naturally resists yellow staining. 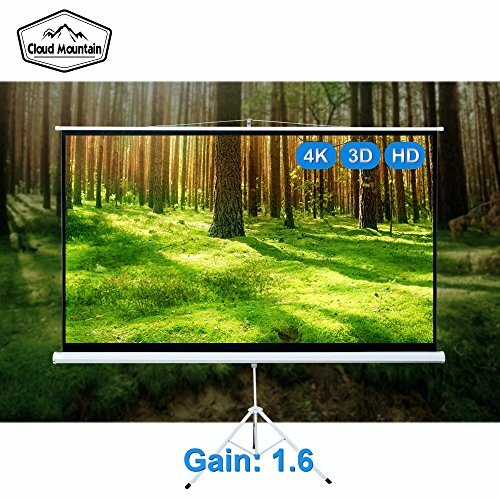 The adjustable tripod makes this projector screen ideal for indoor settings; however, the screen material makes it safe for outdoor screenings as well. Benefits: The Visual Apex projector screen is a solid choice for high-definition viewing in any physical setting. As the name implies, the screen itself has a tall height (measuring 144 inches in diameter), and the product comes with detachable stand legs to make the screen even taller. With options to hang the screen, mount it onto its frame, or use stand legs, this design gives everyone the chance to have a high-quality viewing experience. The cinema-white screen has equally impressive technical specifications that include a 16:9 format, 160-degree angle, 1.1 gain, and compatibility with 3D and 4K ultra HD applications. If you want a large screen reminiscent of an old-fashioned movie theater, this is a straightforward choice. With the screen’s ultraviolet protection and weather-resistant properties, it is also a good option for outdoor events. 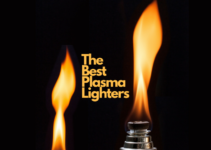 Plus, the product has a two-year manufacturer warranty for your reassurance during use. Benefits: Camp Chef enables you to watch cinema-quality productions either outdoors or in any room in your home. In fact, the product’s signature feature is its Oxford nylon silver screen that provides a viewing experience similar to major movie theaters. 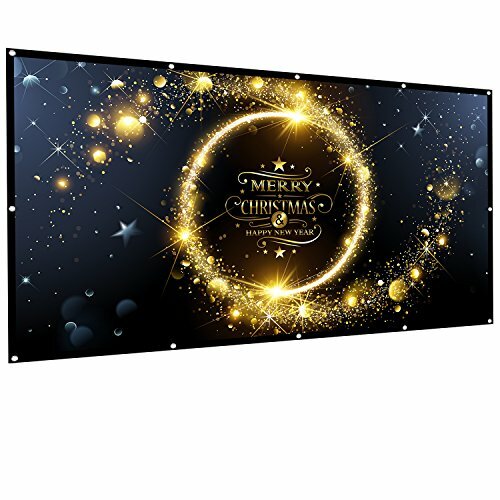 The big screen has a lightweight aluminum frame that hangs easily from walls, on sides of buildings, between trees, or against outdoor structures. In addition, the screen has front and rear projection so that anyone watching can enjoy a stellar view. Benefits: If you need a lightweight and portable home movie screen, Famirosa is a handy tool to keep on hand. It features a moisture-resistant, wrinkle-resistant polyester fabric that is suitable for indoor and outdoor use. This polyester material makes it easy to fold or roll the one-piece screen into a compact bundle and transport it to any viewing location. The screen’s synthetic white surface encourages high image brightness while reducing reflection from sunlight or other distracting sources. It also has a high-definition 16:9 screen format and a 100-inch diameter to ensure consistent quality for numerous types of digital media. Using the projector screen in any location, you can wash it easily with soap and water (and iron out any creases if necessary). Benefits: The Cold Mountain projector screen features a pull-up mechanism similar to traditional overhead projectors. 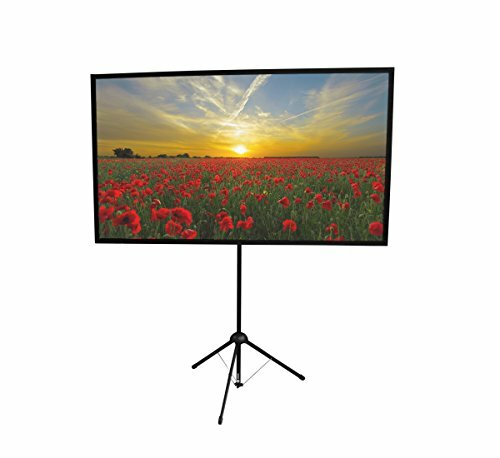 Combined with its portable, foldable tripod, this screen is easy to use at the front of any room. It has a 100-inch diameter and traditional 4:3 aspect ratio for standard and high-definition video. The matte screen has a 1.3 gain that works well in classroom and office settings. 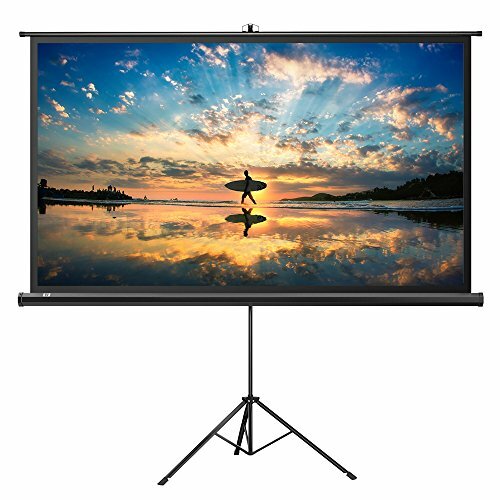 Benefits: As the name suggests, the GO-80 projector screen is for individuals who need compact and portable equipment “on the go.” It is a sturdy screen designed for business and educational travel. Weighing only nine pounds, the fiberglass screen has a 16:9 image ratio and promotes even light distribution indoors. The 80-inch diameter makes it perfect rooms with lower ceilings, and you can use the tripod or mount it up on the wall if you need greater height. This screen also includes its own carrying bag and has a fast setup of two minutes, making it perfect for trips and presentations. Benefits: If you prefer to keep your equipment packed away in your backpack, suitcase, or tote bag, the Owlenz projector screen is an excellent choice for you. Weighing only two pounds, the polyester screen folds into compact sections and slides easily into the transport of your choice. In addition, the screen comes with bundle ropes and bags hooks for simple storage. Eyelets around the screen’s black border enable you to hang it onto a wall using mounts like brackets, nails, or tape. The screen is made of damage-resistant polyester and features high-quality 16:9 screen format. 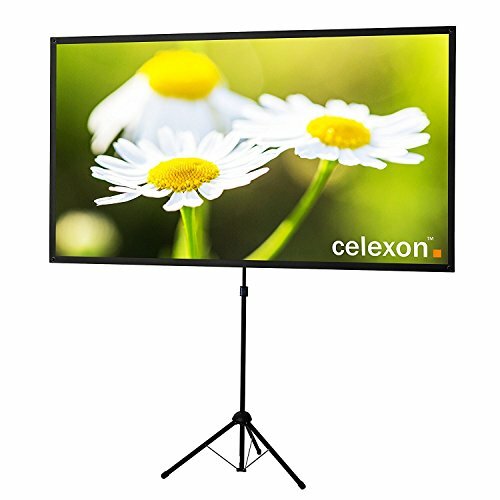 Benefits: As one of the most recognizable names in projector accessories and video production, Celexon offers a projector screen that is both convenient and easy to assemble. This fiberglass screen has a matte frontal surface with black backing to prevent light absorption and flicker. With its 120-degree viewing angle, the screen features a slight curvature to ensure good quality viewing for all individuals in the room. As this is primarily an indoor screen, the Celexon fiberglass screen has a non-flammable rating for safety. The complete package includes a tripod stand and a carrying case for easy portability. 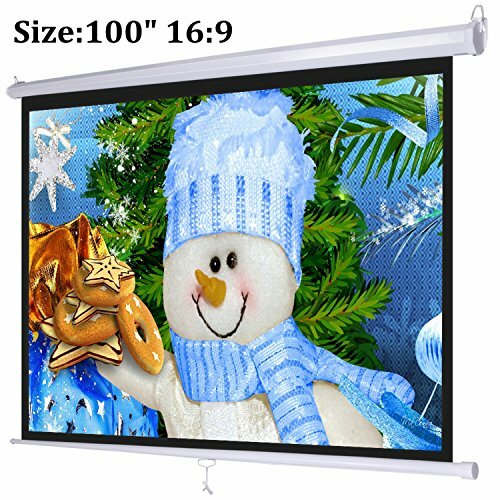 Benefits: Just as some projector screens work best for indoor use, the AbdTech projector screen is a great solution for outdoor or travel usage. This screen is famous for its stability and movie-theater picture quality. The screen itself is made of very thick polyvinyl chloride (PVC) polymer that resists wrinkling, creasing, and weather damage. In addition, the screen comes with a stable base frame, location hole, and locating pin to keep it steady during outdoor excursions like camping or backpacking. The stand is made of high-density aluminum poles and fixtures to keep it firmly in place and to prevent the screen from curling or creasing. When you are ready to store the screen and its base, all materials fold easily into the convenient travel bag for transport or storage. Benefits: The Auledio projector screen allows you to instantly adjust your viewing window to any desirable length. It features a textured white matte screen with a lanyard that locks the projector screen into place at any increment. The screen has a full 180-degree viewing angle, 16:9 screen format, and 1.1 gain ratio. This screen is also compatible with 4K ultra HD and HDTV video.